Yesterday, I visited Lee Beers, the OSU Extension Agriculture and Natural Resource educator in Trumbull County, and as plant lovers (Lee is finishing his PhD on lowbush blueberry physiology and genetics), we had to take a walk. Adjacent to the OSU, Trumbull County office is county land and the Mosquito Lake State Park. So, in this 48-hour flash quiz, a prize awaits for the person with the most correct answers in that time to the plant and pest photo questions from our walk. If ties; the very first top score shall prevail. Let us begin with pictures of fruits, starting with the cover photo. Oh, and a photo of Lee Beers. I loved my calendar entry for yesterday: ‘Beers and Chat”. Though we actually had diet Cokes, chili, and fried fish at the five-star Four Star Diner in Cortland. 2.) What is this native dogwood? Note the beautiful fruit, peduncle and pedicels that turn more and more reddish-purple as the season progresses. 3). What is this lovely fragrant (leaves and fruits) native woodland shrub, now showing up more in landscapes. I am especially fond of it since it is in the Lauraceae family, probably so named for my wife Laura (fake news!). 4). Name this native viburnum and the insect that almost certainly caused leaf damage. 5.) 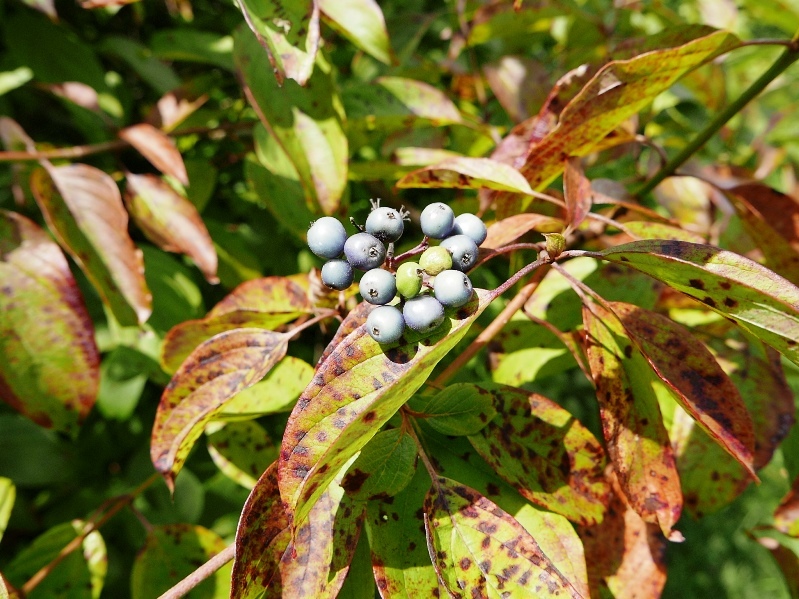 Name this native viburnum shrub/tree and the disease present. 7.) Name the taxonomically torturous genus and the disease present on the fruits. 8). Before you become too certain on #7, based on its shape, on this bygl-alert author, and on the sooty blotch disease and eyespot disease present - this is not a crabapple This should make it a little easier. 10). What is feeding on this Prunus? 11). Er, what is this plant, and explain the fuzzy growth beneath the leaves. Leaves of three - let them be! And, that fuzzy growth? 12). Name this Solanaceous plant. 13). How long can the annual growth on this corkscrew willow really be? How long are the arms of Lee Beers? The Prize…shall be a book. A good book.